Eva LeWitt’s show Untitled (Flora) at the Jewish Museum. Photo: Jason Mandella. Artwork © Eva LeWitt. 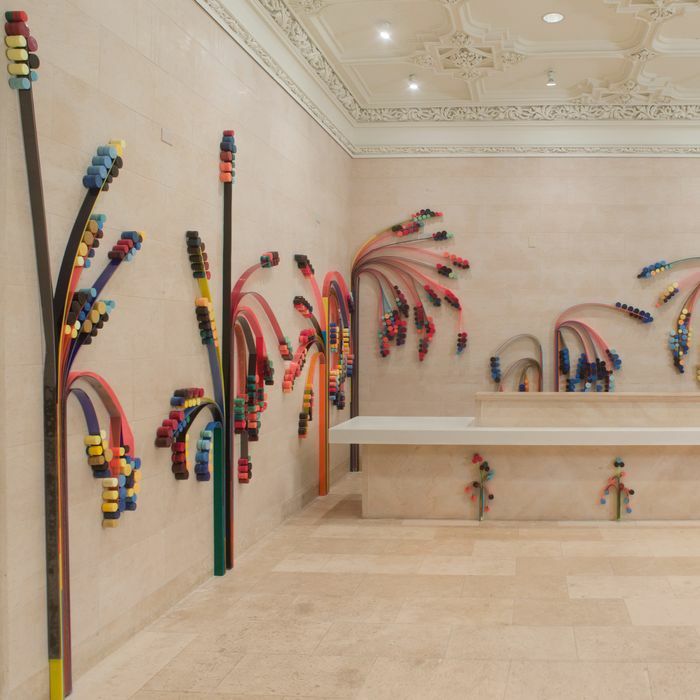 Right now, on the walls of the lobby gallery of the Jewish Museum, there is a site-specific installation called Untitled (Flora), by Eva LeWitt. Made out of Plexiglas and cast polyurethane foam, the work resembles floppy if somewhat abstract bundles of — yes — flowers. They came to be planted through an invitation of one of the museum’s curators, Kelly Taxter, who’d seen some of LeWitt’s previous work at Frieze New York, in the booth of her Oslo gallery, VI, VII, in 2017. The warm, autumnal colors of the work — hand-dyed by the artist — offer a moment of respite to the gathering gray of the New York City winter. LeWitt is also part of “Known: Unknown,” a group exhibition at the New York Studio School on view until December 2. LeWitt, 33, was born in Spoleto, Italy, but grew up in Chester, Connecticut. 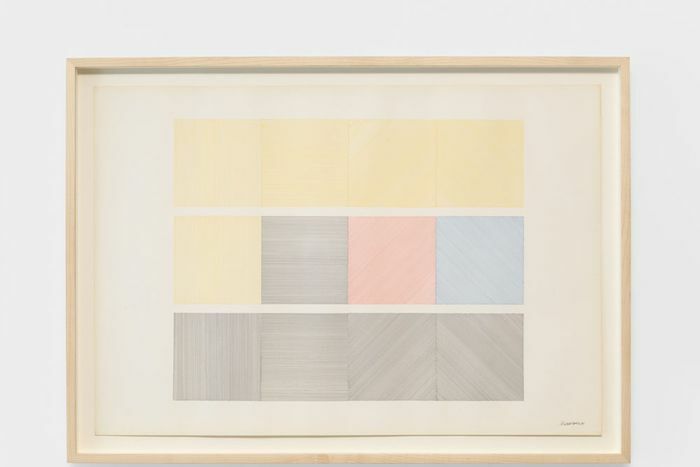 Her father is the late minimalist and conceptualist Sol LeWitt, born 1928, who’d moved his family to Italy in the 1980s after finding success in Manhattan and needing a break from it. He had his first wall drawing at Paula Cooper Gallery, in their inaugural exhibition in 1968 (at the time, he charged “per hour”), and then, ten years later, he had a retrospective at MoMA (New York’s critic observed: “LeWitt’s cool, smooth impersonal textures repel intrusive questions and anecdotal digressions with inscrutable politeness.”) He currently has an exhibition of site-specific wall drawings called Lines in All Directions on view at Mignoni Gallery, accompanied by a few sculptures. LeWitt is soft-spoken and reserved, with a slight frame and long brown hair that falls just below her shoulders. We met at the Jewish Museum, and she sipped LaCroix as we spoke about her work and the experiences that have led to where she is today. Currently, she divides her time between New York and Spoleto, where she has utilized the family property to create an art residency called Mahler & LeWitt Studios. They host residents of various disciplines in the former studios of her father and the artist Anna Mahler, who was a neighbor of the LeWitt’s and whose family is generously involved with the residency. We spoke about finding her way to grow and blossom as an artist and not be too much in the shadow of her accomplished father. How did the show at the Jewish Museum come about? Kelly Taxter [the Barnett and Annalee Newman curator of contemporary art at the Jewish Museum] saw the installation at Frieze with VI, VII, and we did a studio visit. She was open to me doing something new, which was great. She was one of the easiest people I’ve worked with, and when I wanted to install in various sections of the lobby that are often not used, she said, “Do it, as much as you want!” I feel really grateful. This body of work started with a big cluster of dots on the end of a bunch of plastic on the wall when I realized I liked the form and sagging. I thought, How can I turn this bundle into a garden? I have fabricators who help me with some of the technical complexities, such as invisible brackets that adhere to the wall and allow the Plexiglas strips to be placed in and respond to gravity. This show is more connected to representation than any of my other work. The Plexiglas strips or “branches” are flopping and being held in place by their own weight. I see them as having inherent energy, which remains, even when I am not there. The museum makes reference to two of your father’s works from its permanent collection, Wall Drawing #926 Loopy (yellow and purple) and Wall Drawing #927 Loopy (green and blue), both from 1999. Did they provide the images to you before you made the Untitled (Flora) installation, as something you could respond to, or is it provided to give context to the viewer after-the-fact? I had seen the wall drawings when they were first installed in 1999. They were probably subliminally there (in my mind), but haven’t been on view for a long time now. I wasn’t purposely responding to them — though the juxtaposition of the flat graphic colors up against the decorative plasterwork is something I particularly loved about those drawings, and seems to have shown up in my sculptures as well. What was it like growing up with LeWitt? Did you know that your dad was an important artist, or did you see him as just someone who made cool things? I knew it was his job, and I knew that he was good at it. He wasn’t a very public figure. He didn’t like to go to openings. He didn’t really have a glamorous life. He just worked every day. So it was his job, and in that way it was very normal. It took a lot of discipline for it to be that normal, but he loved it. All he had to do was work every day. It was a luxury, and he took it really seriously. I was born in Italy and was there for only a couple of years before returning to America to go to school, but we went back every summer, and my dad had a studio there and worked every day. It was just a regular life, but in Italy. I’m running a residency there now, for artists of all disciplines. We’ve had dancers, choreographers, poets, a chef, painters, sculptors, writers, and photographers. It’s a curated selection, but we are thinking of creating more room for art writers, as it’s a discipline that seems left out. The town Spoleto, in Umbria, has a really interesting history. Many of the best artists of the 20th century, including Alexander Calder, Beverly Pepper and Buckminster Fuller, to name a few, have worked there, and historically it extends to the Etruscans. Sometimes artists just need a little break, and we hope to provide that, a place for them to do their work, or read and go for walks. It’s in my dad’s old studio, and we are lucky to have such a beautiful space. More than anything, he would want for it to be full all the time, with people making a mess, doing stuff … he would love that. When did you know that you wanted to be an artist as well? I kind of always knew. I was his shadow, whenever I could be. He always gave me a lot of confidence, and whatever I made he liked. I think it’s important for an artist to realize that you have to have confidence in yourself or you may not do anything interesting ever, and that is really difficult. But it’s nice to think that it’s in your DNA. How did your practice develop? Well, I went to Bard, for undergrad, and I studied sculpture with Judy Pfaff. Nothing has ever held her back, and she uses materials at a monumental scale. She is this tiny woman, and she gave me a lot of confidence. I also worked with artists as a studio assistant for ten years. I was very lucky to work with artists who were very respectful of my own work. Whenever I had a show, they’d let me take a week off here or there. I also had time to focus on my work and practice. I worked for Tom Sachs and Tara Donovan, and obviously I learned a lot from them, technically and by observing how they run their studios. With Tara, I traveled a lot and did a lot of installations with her on-site, so [doing site-specific installation] doesn’t scare me. Her work is really monumental, and it allowed me to learn how to enter big spaces. Your sculptures are quite painterly, did you start out as a painter? When I started making sculptures in 2006, the struggle [that I felt previously with painting] was gone. Sculpture generated more sculpture, whereas painting made me never want to pick up a paintbrush ever again. I haven’t stopped making sculptures since that day, so I know it was right … It took me a long time to isolate what was important and what I wanted to do. That coincided with people having faith in me and trusting me, giving me the opportunity to do something on a big scale. I spent a lot of time alone in the studio playing around, figuring it out. After Esperanza [founder and director of VI, VII, Oslo] and I did our first studio visit, we decided to work together and did Frieze New York in 2017. She and others have played a major role [facilitating my work], giving me wall space. I’ve been fortunate to have subsequent opportunities since then; it’s taken a lot of people, not just me. You are part of a group exhibition called, “Known: Unknown” at the New York Studio School, can you speak a little bit about that? For that show, I was invited by artist Dorothea Rockburne, who is my godmother. The show is about more established artists picking younger artists to be in the show with them. She chose me not just because I’m her goddaughter — I don’t think — but our works work really well together. It was really fun to do a piece that was not really big, while I was doing this. It felt like a break and was fun to make. I didn’t make it in response to her work, and it was just made intuitively. Were there works made over the years by your father that you were witness to, that influenced your work and the way you occupy the expanse of a wall? I mostly saw him doing gouaches, where it was just him and a piece of paper, and he was making paintings. A lot of those gouaches became wall drawings or the wall drawings became gouaches, so it was always connected to his other work, but it was a personal practice. He’s known for having assistants do his work, but that was work that he did that no one else could make — him cutting paper, mixing paint, it was very honest, and he really enjoyed it. You never want to think about what to do next, and he had this personal, solitary practice that always kept him going. I like to make little things in my studio to experiment with materials that then can become bigger. I don’t make elaborate drawings but use chicken scratch to plan out the installation, less of a drawing and more of a notation. What else has influenced you? What sorts of books do you read? I like detective fiction, and maybe there is something to that. I like a story with a beginning, a middle, and an end. I’m not trying to create a mystery but tell a story and have it be quite satisfying. I don’t want to overintellectualize the work. It’s more important for me that the museum guards, who are sitting with the work all day, like it. I don’t want it to create more questions than answers, and figuring this out about myself has been very freeing.